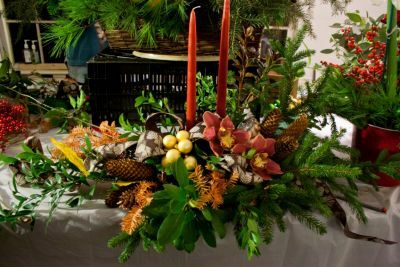 With the holidays sneaking up, it's time for "Holiday Inspiration with Lisa," our annual holiday decoration demonstration by Lisa Ahern, floral designer for Cedar Grove Gardens. On Wednesday, October 17, 6:30-8:00 pm, Lisa will share her tips on how to create beautiful and easy floral accents for the holiday home, emphasizing creative and fun ways to make your home and table "shine" during the holidays. 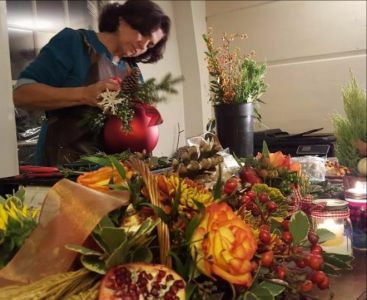 Enjoy some light refreshments, mulled cider or a glass of wine while watching Lisa work her magic! Most of the arrangements created during the workshop are raffled among those present at the end of the evening. Price for the workshop is $25 per person, $15 for members. Pre-registration is required. For more information or to register, call 617-333-0924 x22. Thanks to Richard O'Mara of Cedar Grove Gardens for donating all materials used at the demo and Lisa for donating her time and expertise. Cedar Grove Gardens is a great place to get all your holiday decorations.